If you read this review to see whether a book is sufficiently good to buy it, read no further: John Grainger’s The Syrian Wars is a good book. It is even an important book, and if I will appear to be very critical, this is because it is worth criticizing. The nine Syrian Wars, waged between the Seleucid and Ptolemaic Empires over the possession of Coele Syria, are a neglected subject. There were few battles to attract the historians’ attention, but more importantly: Rome was at the same time uniting the Mediterranean, a process that was to have more lasting consequences than the eastern wars. 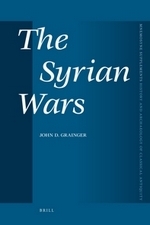 Grainger, however, succeeds in showing that the Syrian Wars deserve more attention. He stresses that the conflict was central to the growth of the governmental system of two Hellenistic states, which he calls ‘competitive development’. On which foundation does he build his thesis? On written sources and coins, of course, which he treats with great care. However, this also means that The Syrian Wars is essentially a N=1 study, which might be refuted easily. As Grainger indicates, any part of his reconstruction can be challenged by the discovery of new texts. If this happens several times, it will be fatal to his thesis. When empirical foundations are weak, students of most disciplines invoke comparisons. When they do not have sufficient evidence to build a firm structure, it is useful to tie it to more solid objects. This is why historians of Antiquity are inevitably forced to compare their reconstructions to reconstructions of comparable processes in other pre-industrial societies. Fortunately, the necessary parallels exist. Competitive development is hardly unique; historians and sociologists have often shown that state formation is usually a consequence of a prolonged military conflict. Tilly’s Coercion, Capital, and European States (1990) is a modern classic. If Grainger had referred to it, his book would have been more convincing, because its thesis would be based on more than one example. N=10 is better than N=1. The need for comparisons is even greater, because Grainger appears to be unaware of a lot of recent literature. The new sources that might challenge parts of his reconstruction, have in fact already been published. For instance, Grainger’s dates of the Second Diadoch War are based on Manni’s ‘low chronology’ (1949), not on Tom Boiy’s little gem Between High and Low (2007). The relevant new sources are ostraca and cuneiform texts. Occasionally, Grainger is unaware of new readings of well-known texts. It is strange to see how he antedates the Antigonid invasions of Babylonia to 311, and presents Ptolemy’s naval expedition to the Aegean in 309 as a trick to lure Antigonus away from the eastern theater of war. This leaves the reader with a sense of confusion, because one would expect the two operations to be more or less simultaneous. Fortunately, the problem is only apparent: the Chronicle of the Diadochs (= Babylonian Chronicle 10) dates the Babylonian War to 310/309. Grainger knows the source, but ignores recent scholarship. This can also be said of his treatment of the reign of Antiochus IV. Fortunately, his treatment resembles Mittag’s beautiful Antiochos IV (2006). Both authors show that the king pursued a policy that is far more rational than the authors of the ancient sources are willing to admit. Grainger’s discussion of the Third Syrian War ignores BCHP 11, a chronicle that not only proves that the Egyptians captured Babylon, but also offers interesting details about the fights. After an unsuccessful siege of Seleucia-on-the-Euphrates, Ptolemaic heavy infantry (‘ironclad Macedonians who are not scared of the gods’, according to the chronicler) attacked Babylon, which held out twelve days until it fell on January 20. The citadel remained in the hands of its Seleucid garrison, however, and early in February, the commander of Seleucia tried to lift the blockade. He was defeated and the Seleucid troops who had remained in Seleucia, were massacred. We do not know what happened next, but this is important information. Grainger, unaware of this first-rate source, concludes ‘that Ptolemy crossed the Euphrates but did not reach Babylon’. The real problem, however, is not that Grainger ignores useful comparisons and recent scholarship. The study of ancient societies is complex, no one can know everything, and scholars cannot even establish what they do not know. Ancient history is the discipline of the unknown unknowns. To fill the lacunas in the knowledge of their writers, publishers have boards of editors. If Grainger is unaware of the existence of BCHP – which is, like so many cuneiform resources, only available online – it is the editors’ task to help. This time, however, the board has been sleeping, which may also explain the unusually great number of typos and the unusually poor maps. All this should not distract us, however, from the simple fact that Grainger has written an important book that no student of Hellenistic institutions or military history can afford to ignore. With a more energetic board of editors, it might have been a good book, but still, Grainger has achieved his aim: to prove that the continuing conflict forced two Hellenistic states ‘to undertake measures to strengthen themselves internally, financially, militarily, politically, by alliances, and by recruiting manpower, so that they could face yet another war which both sides came to anticipate’. This entry was posted on Sunday, October 28th, 2012 at 9:48 pm and is filed under ancient egypt, ancient greece, ancient history, ancient Lebanon, ancient syria, Classics, military history. You can follow any responses to this entry through the RSS 2.0 feed. You can leave a response, or trackback from your own site. I’m not certain the word “definitive” is a usable word in history.History has shown to be its own master and though its said it repeats itself we never get the interpretation right be it modern or ancient(especially modern,sadly).But we must always seek out the truth as we see it whether we make good use of it or not.I am by no means a knowledgeable commentator,author,or ‘ologist but I have read much history in my life and the changes I have seen in my short life,puts “definitive”in its correct context for me….a rest stop until the next questions call out…”All aboard!”.Thanks for another fine article.Garry in Kentucky. I agree that the comparative approach is very important and useful. Classicists need to communicate with economists, historians, anthropologists, and so on, and this is not done as often or as well as it could be. But it is important to make sure that this is not one way … and here I am thinking all the attempts to force ancient economic history into a theoretical mould based on 18th and 19th century data (whether Marxist, primitivist, capitalist, or Malthusian). These attempts were often learned, painstaking, and well-meaning, but they sometimes caused people to see what their models told them they ought to see rather than what the evidence best supported. Sometimes its specialists in later periods who need to ask classicists “I think this is a general rule … does it fit the cases you are familiar with?” so they can be surprised by three counter-examples. I love your reviews Mr. Lendering (thank You for all your work, especially providing acces to cuneiform sources!). For me the book is very good, because it offers insight into organization of Seleucid states, their kingship, cities, many bits of informations not easily accesible. The main point of the book lies somewhere else. The Syrian wars were (not just my opinion) from economic and military side needles. Ptolemaic Egypt could defend the Pelusic branch by series of fortresses just like in times of pharaos in Late Bronze Age. Seleucid kingdom need this territories more, trade links, taxes, acces to sea, strategic naval bases etc. But still it would take some time for me to write the short article about price of war for both kingdoms. Only the readers will understand, that few hundred talents a year cannot pay military campaing, which last usually longer than year and cots over 1000 talents least.